I want to start this post to say that this post is pure speculation / wishful thinking minus one shred of information. I recently received some word that a runDisney announcement will be happening soon and is not the ill-kept secret of a Disneyland Paris race. That is the one shred of real information in the post. The rest is my wishful thinking that the announcement is about a new race, that the race is in Florida and that the race could be a Star War race in Walt Disney World. My guess is, if they're going to be announcing a race, it would likely be a replacement to Expedition Everest Challenge, which was recently announced to be in it's final year OR it could be a replacement to Tower or Terror that was left off the 2015 schedule with little in the way of official announcements. So I did some thinking as to what I would want and what would make sense. One of the previous rumors was a Star Wars race in Walt Disney World to replace EEC to coincide Star Wars Weekends in Florida. I recently also stumbled across an old post by April at Run The Great Wide Somewhere where she speculated a Star Wars race still coming to Walt Disney World even after the Disneyland announcement. She has much of the same wishful thinking as me. So how does it fit in? First, it really could fit either of the two weekends. Both races have the trouble of not being a race that is Coast to Coast eligible. What do I mean by that? I have a previous post on what is the Coast to Coast Challenge, but it boils down to running a half marathon (or longer in the case of the Walt Disney World Marathon) in both Disneyland and Walt Disney World in the same calendar year. While you don't explicitly pay extra money for this challenge, you do by registering for two race, as well as Disney having the opportunity to have two hotel stays, two sets of park tickets, two sets of merchandise, etc. There is already a standard coast to coast medal and a special pink Coast to Coast medal for running the Princess Half Marathon and the Tinker Bell Half Marathon. Adding a Star Wars race in Florida adds not only an extra race that can qualify you to get a Coast to Coast medal but it also opens an opportunity for a Star Wars based Coast to Coast Challenge. Geek Coast to Coast anyone? Second, both race weekends feature a night race. In the case of Tower of Terror 10 Miler, it was a villain themed race, which was an aspect many people loved about the race. It was one of the things that made the race unique and a point I saw brought up a lot when the non-announcement came out. The potential Star Wars Walt Disney World race could be a Dark Side race which would keep the villain race alive and well. This would also help to differentiate the Star Wars races a little bit between the two coasts, so it wouldn't feel as much like the same race in two places, which in turn gives people reasons to run both races, something I'm sure runDisney loves. Now, if you were runDisney and you were going to announce a second Star Wars race, and I'm not saying they are, when better to do so than at the inaugural Star Wars race weekend in Disneyland? That falls under the "soon" category for me. That would frankly be the perfect time to generate a TON of hype (not that the announcement alone wouldn't do so). So, remember that this post is not based on any facts. It is purely my thoughts and a shred of a new hope for a Star Wars race in Florida. What do you think about a possible second Star Wars race? Would you want it? What do you think the announcement is about? Super cool! The Star Wars one interests me the most out of the Disney runs. I was really hoping the first time around that it would land in WDW, but they needed a race to fill the weekend in Disneyland. Not that I'd put a huge weight on it, but I'm hoping that maybe it will come to WDW too. Very interesting thought process John. Giving older runDisney racers a new coast to coast challenge would be a great idea. I love that they added the pink C to C even though I am not a fan of the actual medal. With 2 coast to coast already on my medal rack, a new design would be great! I have a friend who does a lot of the WDW runDisney races who recently earned his coast to coast medal and said that a new coast to coast such as that one would be enough to get him to do it again. Me too. I think it would be a great fit but would also just personally love it as well. I am trying to hold out my hopes. Haha. 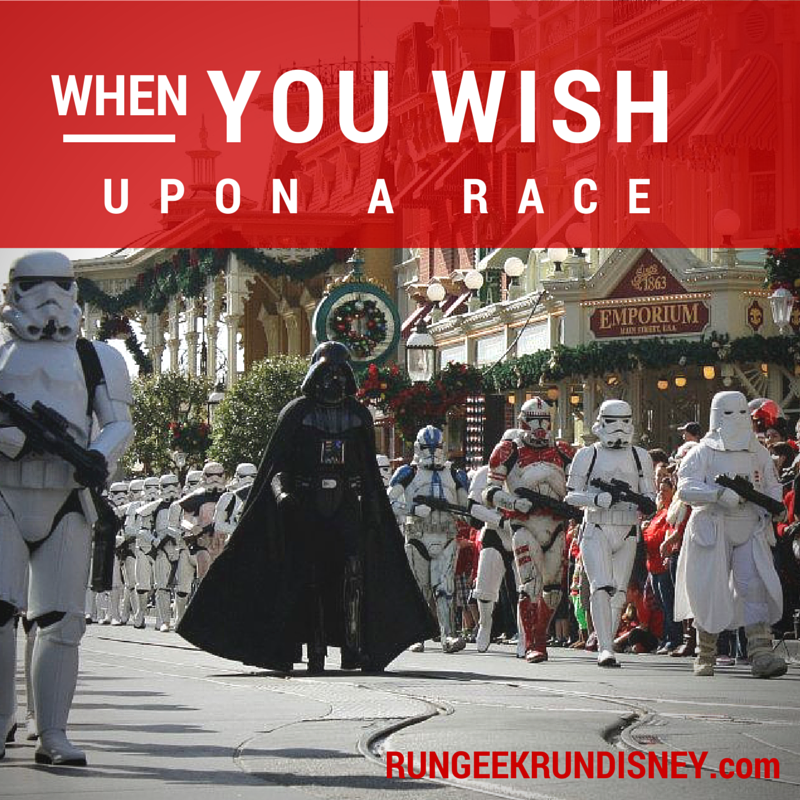 I would love to see a Star Wars race at Disney World! I was a little disappointed (but not very surprised) that they scheduled the Star Wars half the weekend after the full in Disneyland. I just can't make that kind of coast to coast hopping happen. I was also pretty sad that they weren't bringing back ToT. I loved the timing of that race with F&W and MNSSHP. Here's hoping they have something good in the works!